68 million children of primary school age were out of school in 2008 according to estimates by the UNESCO Institute for Statistics (UIS). 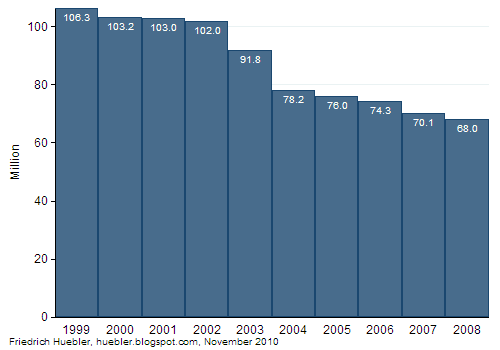 Compared to 1999, when 106 million children were out of school, this is a decrease of over 38 million (see Figure 1). However, in spite of the observed progress over the last decade, the Millennium Development Goal of universal primary education by 2015 will not be reached if current trends continue unchanged. Source: UNESCO Institute for Statistics, Data Centre, November 2010. The UIS also publishes data on the regional distribution of children out of school, but complete data are only available until 2007. 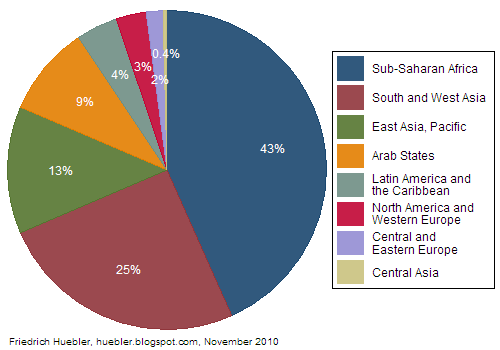 43 percent - 30.4 million - of all children out of school in 2007 lived in sub-Saharan Africa (see Figure 2). A further 25 percent - 17.7 million - lived in South and West Asia. These two regions combined accounted for two thirds of the global out-of-school population. The shares of the remaining regions were as follows: 13 percent of all children out of school lived in East Asia and the Pacific, 9 percent in the Arab States, 4 percent in Latin America and the Caribbean, 3 percent in North America and Western Europe, 2 percent in Central and Eastern Europe, and less than 1 percent in Central Asia. Regional and global estimates of the number of children out of school can be obtained from the UIS Data Centre. On the main Data Centre page at stats.uis.unesco.org, click on Predefined Tables and then Education. Table 20H, "Regional sum of primary school age children out of school", lists the total, male and female number of children of primary school age out of school for the period 1999 to 2008.